As Pope John Paul II's health declined in recent years, so did his ability to speak to his flock of more than one billion Roman Catholics worldwide. In response, the man who had transformed the role of pope from that of administrator to global evangelist abandoned sermons from the pulpit in favour of messages in cyberspace to spread his word. Establishing a "virtual papacy", the Pope issued letters, speeches, personal reflections and sermons through the Vatican website, which launched in 1995. Now, many of the Catholic Church's cardinals, the high-ranking priests from whom the next Pope will be elected, are following suit, using the internet to address their congregations. Just weeks before his death, Pope John Paul II issued a letter urging priests and Church officials to explore the internet's potential for evangelisation and education. ''Do not be afraid of new technologies! These rank 'among the marvellous things' - inter mirifica - which God has placed at our disposal," he wrote. 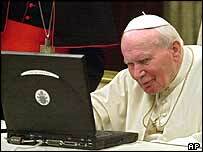 The Pope's call for internet presence has been followed to varying degrees by Catholic dioceses across the world. Typical of many Church websites is that offered by Cardinal Cormac Murphy-O'Connor, Archbishop of Westminster, and head of the Catholic Church in England and Wales. The site is a sober affair, offering biographical information on the cardinal, and transcripts of recent sermons and articles. This is stark contrast to the site for the Archdiocese of Bombay, where inclusion in the personal prayers of Cardinal Ivan Dias is just a mouse click away. By simply filling out an online form, worshippers can ask the cardinal to pray for themselves or others - a handy drop-down menu allows for the easy selection of specific requests, ranging from a "happy death" to help in finding a suitable job. In Austria, the cardinal of Vienna, Christoph Schoenborn, is similarly keen to foster a close relationship with his flock, keeping them up to date on his trip to Rome to join the Pope's funeral and subsequent conclave. 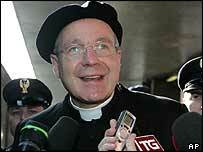 Jaunty photos of him waving goodbye from a train bound for Rome accompany an article on his trip to the Vatican. Unofficial fan sites, which extol the virtues of favourite servants of the Church, also abound. 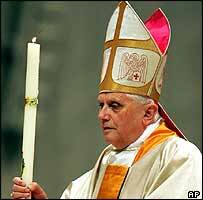 German Cardinal Joseph Ratzinger, who heads the Vatican department once known as the Holy Inquisition, has two unofficial fan sites. Supporters can purchase T-shirts and hats declaring support for the cardinal, branded with the phrase: "Putting the smackdown on heresy since 1981." While an unofficial site dedicated to Cardinal Godfried Daneels of Belgium pushes him forward as a possible papal successor. "The next time the white smoke wafts its curly way from the Vatican chimney to heaven, let's all hope the holy skywriting spells DANNEELS," it declares. The former Bishop of Evreux in France, Jacques Gaillot, has ventured even further into cyberspace, establishing what he calls his "diocese without borders". The Vatican sacked the "red cleric" from his post in Evreux for his liberal views, placing him in charge of the Diocese of Partenia instead. But the appointment was actually a punishment, since Partenia no longer exists. The once bustling centre of commerce located in modern-day Algeria disappeared beneath the sands of the Sahara 1,500 years ago. In response, the bishop developed a website where he can preach with passion to millions. Hardly surprising then that the Vatican has been conducting a search for a patron saint for the internet and computers. A leading candidate is 7th Century Archbishop Isidore of Seville, author of the "Etymologiae," which some have called the world's first Christian encyclopaedia.